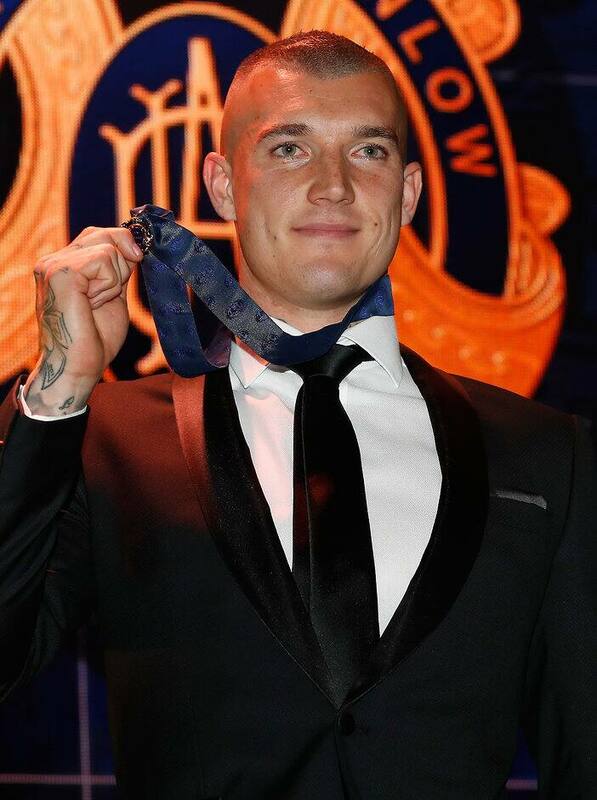 RICHMOND superstar Dustin Martin has lived up to his unbackable pre-count billing by claiming a record-breaking Brownlow Medal victory at Crown Palladium on Monday night. Martin, the shortest-priced favourite in history at $1.03, polled a record 36 votes – excluding 1976-77, when two umpires awarded separate votes – to win by 11 from Hawk Tom Mitchell (25) and Sydney's Josh Kennedy (23). The 26-year-old had a share of the award by round 21 and could not be beaten a round later, when he already had 30 votes to his name. Martin's 11th set of three votes in the final round saw him break reigning winner Patrick Dangerfield's record haul of 35 votes from last year. It also gave him the most three-vote performances in Brownlow history, passing the nine best-on-grounds polled by Greg Williams (1994), Nat Fyfe (2015) and Dangerfield (2016). "It's a pretty surreal position to be in, obviously getting the (Brownlow) Medal and being in a Grand Final, so it's pretty awesome," Martin said. "Ever since back in the day I knew this (playing in the AFL) was all I ever wanted to do, so I put everything into it and I'm glad it's paying off. "Every year you learn new things in the game; whether it be better diet or a bit more cross-training or a bit of meditation here and there – finding new things to make you better." But Dangerfield's ineligible status was the elephant in the room. His round 19 suspension for a dangerous tackle on Carlton ruckman Matthew Kreuzer spoiled what could have been a spectacular race. There were murmurs when Dangerfield shot four votes ahead of Martin on the back of 22 votes in an extraordinary eight-game stretch between rounds nine and 17. The champion Cat finished with 33 votes. "He is a champion, Paddy. I have great respect for him, but it would have been a bit awkward if he beat me … so it's a bit of a relief there's no awkwardness," Martin said. Martin's ability to block out the constant discussion about his dominance and, until recently, his out-of-contract status remains part of the fascination about him as a footballer and person. But the man himself says it's a cinch. "As soon as I get into the footy club, and out there on the 'G, all I'm thinking about is footy. The rest is just noise," he said. "I've probably just got to deal with (the attention) and cop it. I don't spend too much time thinking about it – I'm just here to play footy. "It will just be business as usual tomorrow when I get into the club, and for the rest of the week. Hopefully we can celebrate with a premiership this week." Martin hailed Tigers captain and former housemate Trent Cotchin's impact on his life, as well as his rockstar manager Ralph Carr and coaches Damien Hardwick, Blake Caracella and Andrew McQualter. Ex-Richmond assistants Wayne Campbell and Mark Williams also scored a mention. The winning margin, which beat fellow Tiger and dual Brownlow medallist Roy Wright's 10-vote triumph in 1954, gave weight to Hall of Famer Leigh Matthews' claim Martin's was the best individual season ever. Martin's night began in perfect fashion, receiving maximum votes in Richmond's season opener for his 33 disposals, six clearances, six inside 50s and four goals against Carlton. But he took an early backseat to fast-starting Crow Rory Sloane, who had 12 votes through six rounds. Sloane managed only eight more. Martin rocketed into the outright lead for the first time in round 11 with the fifth of his 11 three-vote performances, and from there his greatest opponent was history. He polled in 14 of his 22 games to break Dangerfield's overall tally of 35 from last year. Dangerfield polled in 15 matches in 2016, relegating Martin to third. Martin is bidding to be the 14th player to achieve the Brownlow-premiership double in the same season, with the Tigers playing in their first Grand Final in 35 years on Saturday against Adelaide. The boy from Castlemaine averaged 30.2 disposals, kicked 32 goals and ranked first in the AFL in inside 50s, centre clearances and broken tackles and third in contested possessions. Martin ended months of speculation when he signed a new seven-year deal, reportedly worth between $1.2 and $1.3 million a season, on finals eve to remain at Punt Rd. "It was certainly stressful," he said of his contract saga. "By the end of it, I was sick of everyone talking about it, sick of my ugly face being in the paper every day. Ralph was great to me. "I pretty much lived at his house towards the end, I'm just glad it got done." Fourth-most clearances this season (155) behind leader Patrick Dangerfield.